At our medical health and beauty clinic in Knightsbridge, we’re proud to achieve fantastic results with minimal invasiveness. The first ever surgical facelift reportedly took place in Berlin in 1901, over 110 years ago, and came with so many more risks than those perfected today. However, the modern surgical facelift can still represent a lot of downtime, recovery, and well… surgery. Wouldn’t it be brilliant if there was another option or, to be more precise, 3? Omniya are proud to champion these 3 ways to achieve a non-surgical facelift. The thread lift is a great way to achieve facial rejuvenation without surgery. We safely use tiny, biodegradable PDO threads under the skin to lift and tighten the target areas. This procedure was designed specifically to softly lift the face and requires specialist training, making your treatment with us safe and reliable. This procedure stimulates the body’s natural reaction to a foreign body, this being the threads. This prompts the skin to produce new collagen, essential for youthful-looking skin, and improve its blood circulation. The tissue then contracts, lifting and tightening in the natural process. Your results can be immediately visible but remain soft and subtle. They will continue to develop over the proceeding 2-6 months, allowing for a discrete yet effective treatment journey. This non-invasive treatment is an effective alternative to surgery. This advanced treatment uses precise and targeted injections of dermal filler and anti-wrinkle injections to subtly refresh the face. We can safely treat areas like nose-to-mouth lines, marionette lines, hollow cheeks, and loose skin. This non-surgical facelift is ideal for restoring volume, re-contouring, and avoiding the sunken look that loose skin can provide. The great part about this treatment, and the thread lift too, is that your results can be long-lasting yet temporary. If you decide that this treatment isn’t for you we can reverse or soften the effects, or top-up a little if we deem it appropriate. Our non-surgical facelifts, particularly the 8 Point Lift, come with no absolute commitment to their results and minimal downtime. This makes them the perfect alternative to invasive and often non-reversible surgical options. For those unwilling or unsuitable to receive surgery, this non-surgical facelift method is ideal. This treatment is handcrafted to the individual and harnesses the combined power of radiofrequency and vacuum suction. The heat of the radiofrequency breaks down fat cells and reduces their volume, while the suction induces the contraction of collagen. This increases the production of new collagen and elastin as your results develop. This treatment is completely customisable so if you don’t opt for a full non-surgical facelift you can tackle certain problem areas unique to you. It’s especially effective at treating areas such as the outer eye, chin, jowls, neck, and even hands. 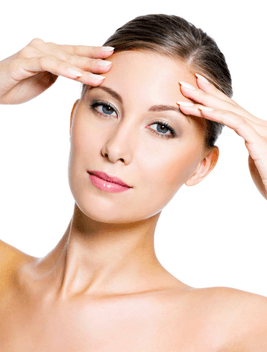 Why opt for a non-surgical facelift over a surgical procedure? Surgical facelifts can produce permanent results, which can be a problem in itself. If, for whatever reason, you’re not happy with your results then it means going back into surgery to ‘fix’ it. This can be expensive, uncomfortable, and take a physical toll on the patient. Our non-surgical facelifts provide brilliant results temporarily and involve stimulating the natural processes of the body. If you decide not to maintain your results, then your skin can return to normal with no hindrance. Surgical facelifts can also be a little noticeable – they provide immediate results that can stand in stark and tell-tale contrast to you before surgery. What is especially attractive about a non-surgical facelift is that the methods we use promote subtle results that develop over a few months. This means that you look naturally refreshed and rejuvenated without anyone knowing you’ve received a treatment, if that’s how you’d prefer it. A non-surgical facelift may seem too good to be true, but we have 3 methods to prove they aren’t. Contact a member of our team on 020 7584 4777 to book your free consultation today, or enquire online today.